Looking upriver through the middle of the three locks on the east branch of the Holland River. 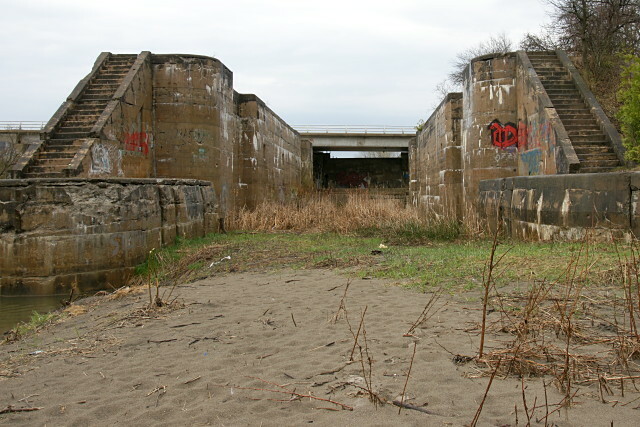 A barrier under the bridge prevents the river from running through the lock, forcing it to run to the left of this picture. On the other side of the barrier is the Rogers Reservoir. 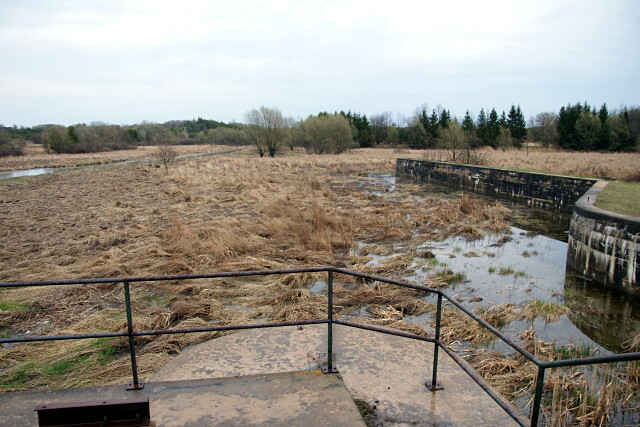 The Rogers Reservoir, looking upstream from the middle lock. I’ve never seen it look like much more than a big marsh. The river channel runs through the upper left of the picture. 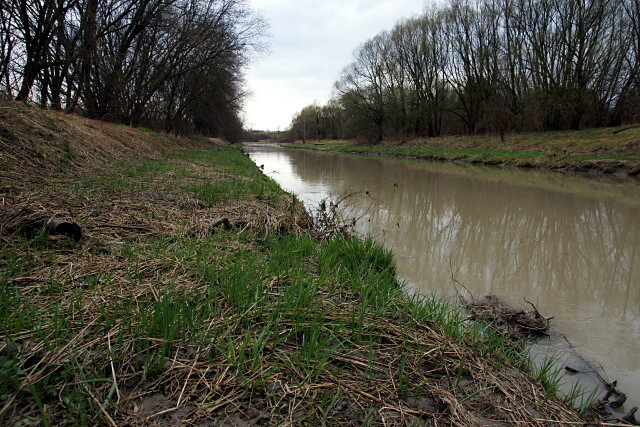 Just upstream from the reservoir, the river runs through a dredged and straightened channel. I don’t think the river is usually this muddy, but it was flowing fast and dirty after the storm. The river passes between the structures for the swing bridge. The bridge piers and swing table are still in place, but the bridge itself is gone. The pedestrian bridge that crosses the river here passes over the original structures. Although it was never used as a swing bridge, it used to carry Green Lane across the river until seven (or so) years ago. The current Google Maps image of the area shows the old bridge supports, but the pedestrian bridge had not yet been built. The third lock going upstream has been almost completely filled in. 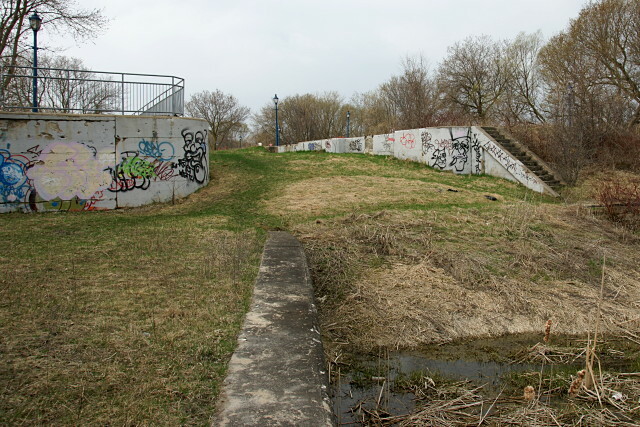 A recreational trail crosses the top of the lock structure and continues past the guardrail at the left of this picture. The third lock again, this time looking downstream from the recreational trail. 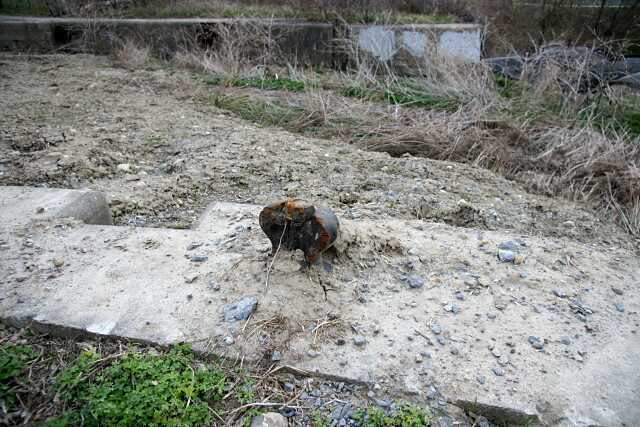 A landlocked and broken bollard for tying up boats is still affixed to the top of the structure. 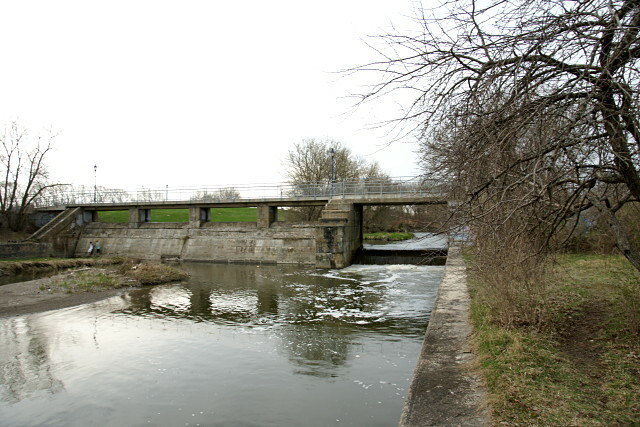 The river still flows through the control structure beside the third lock. 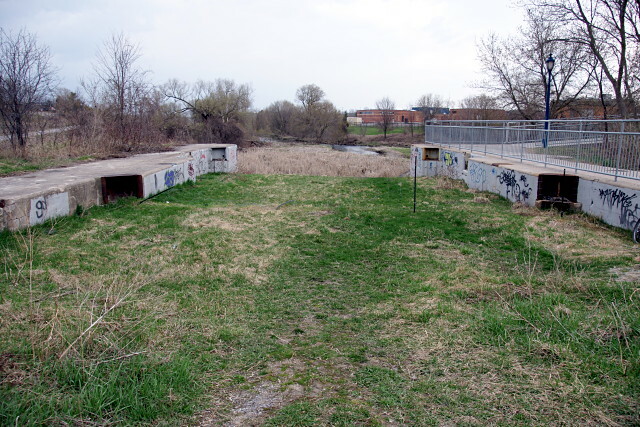 The other remaining lock structure on the river is at Yonge Street just south of Mount Albert Road. I didn’t get to it on this trip. It is a special spot. My wife and I were there a few years ago, as a result of reading Brown’s book as well. But hiding under a bridge during that storm would be kinda neat (for the first little bit – I can imagine it lost its cool factor very quickly). Thanks Val for this superb blog. The adjoining Tom Taylor Trail is part of the Nokiidaa Trail System. Whilst it’s not on the moraine the Oak Ridges Trail Association often has group hikes through this system. There’s so much history right there. Great little write up. Should help to bring awareness to these locks. This a a fourth one that I should point out. Although not a full lock, from what I can tell, there is a structure of the same architecture located at The Tannery on Davis Drive in Newmarket. It also has the steps and bollards. Perhaps this was to be a planned landing for passengers back in the day. Thanks for the write-up – have been looking for a couple of hours for information. Just saw the middle locks today – fascinating story about their construction. Boondoggle on an absolutely massive scale. The engineers said there wouldn’t be enough water – but they went ahead with construction anyway. Must have cost a pretty penny. Great photos. Absolutely nothing about this fiasco in write-ups bout William Mulock – nothing until you check the canal. Construction began in 1906 and he had resigned from politics in 1905 – hard to see how much clout he had in this construction – looking for the books by Williams and Angus now. There are links to Google maps of the two sites under some of the pictures in this post. The third site, which I didn’t visit for this article, is on the Holland River where it crosses Yonge Street. You can’t miss it if you take Yonge through Holland Landing. I live in Newmarket. I ride my bike through this area all summer long and never get bored of it! I find this stuff incredibly interesting but never knew the reasons behind the historic sites. Just wanted to say I admire this kind of stuff and thanks for the history lesson. Too bad the young aren’t smart enough to leave said historical sites clear of their untalented graffiti, but I love that I live so close to such an interesting piece of history. My cousin lives in New market and every time my family goes to visit him and I always take a ride to the trails that surround the locks. I love the mysterious kind of feeling the abandoned concrete structures give off, it never gets old. The trail biking that follows most of the locks is really good stuff! Hey, this is a great post, thanks. I knew of the south canal, as one of my ancestors worked on the project, but i had no idea that portions still existed. Unfortunately, i now live 3000 kms away, but the next time i’m home i’ll be looking for these remnants. thanks again. 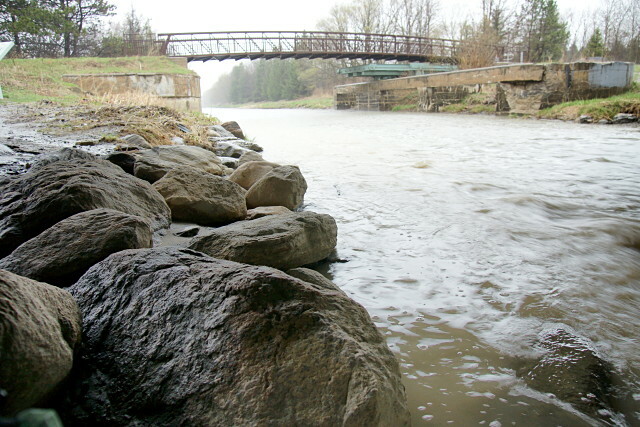 Dont forget the old “Arch” bridge that crosses the holland river just north of queen street in downtown nemmarket. I always found it interesting that a train ran over that bridge. It you look around in the bushes there is lots of old structure still around that has been covered by trees & such. 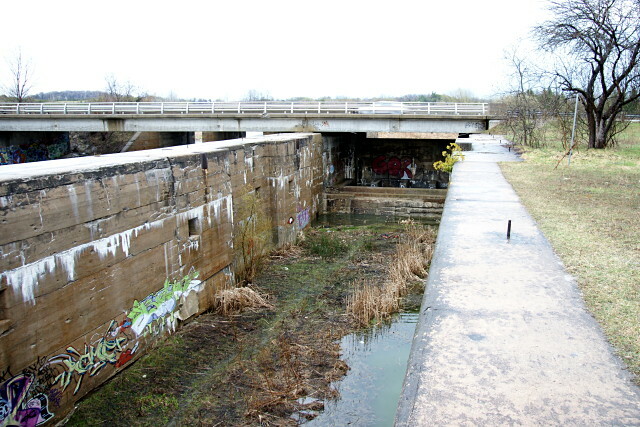 Its always amazed me what newmarket could have been if the whole canal system had been completed………and worked! I used to bike there in the 80’s with my buddies when i was a young kid. Rogers Reservoir used to be dammed higher back then and the whole marsh area was covered in water and formed a fair size lake much bigger than ferry lake in downtown newmarket which is still home to a dam ay Water St. that I believe pre-dates the building of the locks that the old mills used for power generation I believe. I have a great picture of the Davis Tannery from that era showing the old turning basin for the canal at Davis Dr.
You can also see a railway siding running along side of it if you look closely. I bought an excellent little book on the ghost canal published by the Newmarket Historical Society: http://newmarkethistoricalsociety.ca/publications-for-sale/. If you can get your hands on it, I strongly recommend it. I am also looking into this but I don’t think so, as the turn around was at Davis (Tannery Mall). It might be part of an old mill. Good view of old locks through your pictures. I moved to the river in 72 at Queen and Main st s. See Rainbow bridge a structure that supported an elevated train system. 500 meters south is the damn at Fairy Lake. At Davis dr. are old tie ups with the lock structure as part of base for modern bridge. Lock 2 is bay view park buried now as was not the case in my youth when we fished carp there. Rodgers reservoir was then a bay reaching to the base of the far hills featuring a lookout tower of wooden construction . Locks at Holland landing are the least impressive of the 3 locks but do show the old mount for a swing bridge that was never built. The old Davis tannery building was used for Peel fencing co. On the south end and a burned out shell on the north. That it was turned into a marbled mall is beyond my youthful imaginings. Thx for your work on this, all the best in your travels.